Recently, A new version of Cheap Tablet of India - Akash is launched by Indian President Pranab Mukherjee. The new tablet named Akash 2. This new tablet is very cheap in price (Rs. 1,130) and have a lot of features. The hardware configuration is also upgraded. The Tablet is specially manufactured to meet the needs of Engineering Students. The price of Akash 2 tablet is about Rs. 1,130 for students of universities. According to the C.E.O. of Datawind 'Suneet Tuli', The government of India bought Tablet for 2,263 and gives 50% subsidy to engineering student and make this tablet available at very cheap price of 1,130 rupees. This is a good news for engineering students. 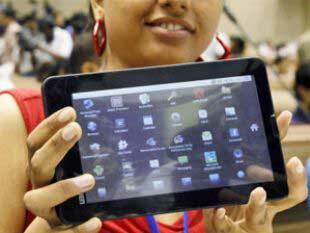 Central Government also stated that State government can also give more subsidies on their own level so this tablet will be available for students at very low cost or for free. Stay tuned for latest updates about Akash Tablet.